Product prices and availability are accurate as of 2019-04-10 15:48:58 UTC and are subject to change. Any price and availability information displayed on http://www.amazon.com/ at the time of purchase will apply to the purchase of this product. 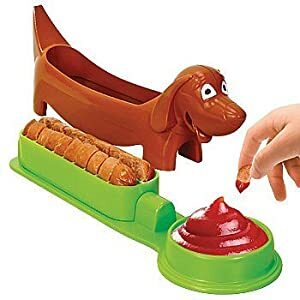 Create fun bite-size pieces in an instant- simply place a hot dog on the base, place the dog-slicer over the hot dog, and push down. The base is designed to fit most standard sized hot dogs and sausages and the special doggie-dipping-bowl accommodates your favorite sauce or condiment. You can use the slic'r on cold or cooked hot dogs. There are no sharp blades or parts, so it is safe for the whole family to use! Wash in the top rack of the dishwasher. 2 pieces- doggie shaped slicer and a base to hold your hot dog and dipping sauce. Package includes 2 hot dog slic'r in green.